(NewsUSA) - Sponsored News - "Go for the Gold" will be the mantra echoed around the globe as the Games of the XXXI Olympiad, or the 2016 Summer Olympics, as we refer to them here in the U.S, gets underway this summer. Rio de Janeiro, Brazil, will play host to a record number of countries participating in a record number of sports. More than 10,500 athletes from 207 countries will "go for the gold," looking to make World Records and beat their personal best along the way. Swimming, fencing, football (aka soccer): 2016 will see a total of 42 Olympic sports categories including one of the most popular and traditional, athletics, which includes running, jumping and throwing. Athletics has been a part of the games since Athens 1896. Today, no other Olympic sport offers more medals: 141 total. There are many ways people will be going for the gold this summer -- some with mobile devices. Talking Tom, legendary apps athlete and star of the hit animated series on is looking to break records this summer with the XXIII app release in the Talking Tom franchise, Talking Tom Gold Run. This new release from Outfit7 breaks new ground as one of the first infinite runner games that immerses players into the action with an actual reason to run. Talking Tom Gold Run begins with a robbery, causing the player to run as fast as possible to retrieve their stolen gold, dodge obstacles and collect rewards. The game allows players to get back their gold bars to help Tom and Friends build their dream homes from the ground up. Fans have a total of seven worlds to unlock, including the city, woods, beach and more. As each character's houses are built, new home upgrades, characters and running segments appear. Outfit7, Limited -- makers of the Talking Tom franchise is also breaking a major digital record this summer, crossing the 4.5 billion download mark across its series of family-friendly apps. That's right, 4.5 billion, with a "B." That's over half of the entire world's population (according to the U.S. census, the worldwide population is over 7.3 billion and counting), and more than those who watch the Summer and Winter Olympics combined. Since the first Talking Talking Tom and Friends app launched over five years ago, the suite of apps has skyrocketed in popularity worldwide. The franchise has also amassed over 5.7 billion views of its various branded content on YouTube. In addition, "Talking Tom and Friends: The Animated Series," currently in its first season, has cemented a rock-solid audience with over 760 million-plus views alone on YouTube and the YouTube Kids app. The series airs weekly and features an all-star voice cast led by Golden Globe and Emmy nominee Colin Hanks ("Fargo") and Tom Kenny ("SpongeBob SquarePants"). Whether you are one of the 480,000 tourists attending Rio 2016, the 1 billion fans watching the games on TV or 4.5 billion people playing Talking Tom and Friends apps, download the new Talking Tom Gold Run app and go for the gold today! Available for iOS, and Android Windows and Amazon. 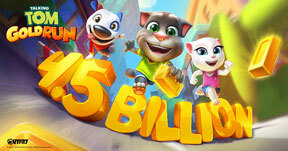 Digital champions like Talking Tom and Friends are also breaking records during the Olympics.